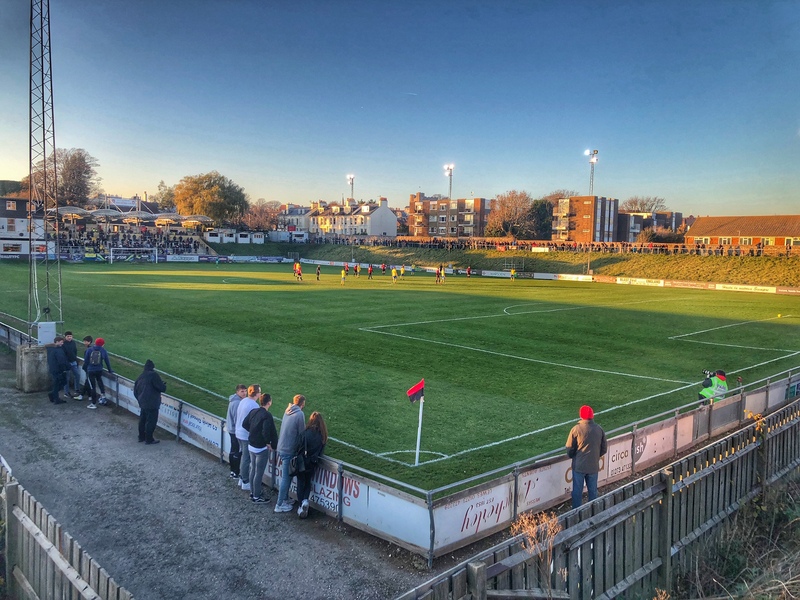 A disappointing display saw Lewes fall to their second consecutive league defeat, with a second-half penalty from Joel Nouble enough to help a well-organised Haringey Borough side to a 1-0 victory at the Pan, reports Tom Harper. Darren Freeman made one change to the side that beat Merthyr Town 2-0 in the FA Trophy last weekend, with Kieron Pamment replacing the injured Ronnie Conlon in the starting line-up. Haringey started the game brightly and controlled possession during the opening stages, seeing an effort from the edge of the area come back off the post with Lewis Carey beaten as they looked to score the goal their early pressure arguably deserved. Lewes began to gain a foothold in the game as the half progressed and without playing at their best, started to cause the visitor's defence a few more problems. The Rooks had two good chances to take the lead before the break, but saw both Omarr Lawson and Luke Blewden denied by Valery Pajetet after they had got in behind the Haringey back line. The final chance of the half fell to the visitors, who saw Charley Barker hit the top of the bar from just inside the area after being teed up by Michael Ademiluyi at the end of an incisive counter-attack. Haringey started the second half on the front foot and were given a great chance to take the lead just five minutes after the restart, as Luke Blewden was adjudged to have handled the ball in the area during a goalmouth scramble, with referee Adrian Harris showing no hesitation in pointing to the spot. Joel Nouble stepped up and calmly converted the penalty to put the visitors in front after 50 minutes. Darren Freeman introduced new loan signing Dayshonne Golding almost immediately, and the winger's pace gave the Rooks more of a threat going forward straight away, although there were still very few chances of note as the half progressed. If anything, it was the visitors who appeared to have more of a cutting edge in the final third, as Michael O'Donoghue rattled the crossbar with a powerful 25-yard free-kick. Lewes were finding it difficult to create any clear-cut chances to equalise, with their best opportunity falling to Jonte Smith with just under 20 minutes remaining, the striker heading a Luke Blewden cross wide from close-range. Haringey continued to look a threat when they went forward, and saw Nouble have an effort from the edge of the area deflected just wide, before Carey did well to push a powerful Joseph Staunton strike over the bar just minutes later. Lewes had plenty of possession during the closing stages but were unable to create any further opportunities to equalise, and were left to reflect on a disappointing performance and result heading into a busy week of cup action. Post-match Darren was understandably frustrated when he spoke to Barry Collins. You can read the E-prog here. The Rooks will hope to bounce back from this result when they welcome Brighton & Hove Albion U23s to the Pan for their rearranged Sussex Senior Cup second round tie on Wednesday, kick-off at 7.45pm. Lewes: Carey, Brinkhurst, Wilder, Dome-Bemwin (Golding 55), Chappell, Freeman, Pamment, Hammond, Smith, Lawson, Blewden (Elliott 75). Unused Subs: Day, Gifford, Reed. Haringey Borough: Pajetet, Olufemi, O'Donoghue, Stone, Kirby, Mitchell (Rowe 77), Ademiluyi, Staunton, Mckenzie (Edwards 66), Barker (Djassi-Sambu 89), Nouble.